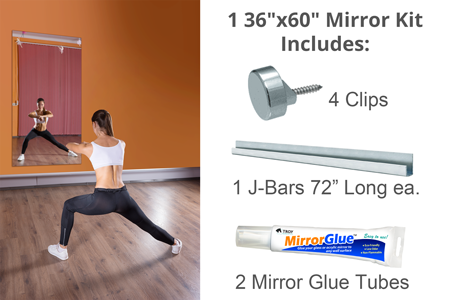 Each gym mirror kit includes a rectangle mirror, a set of chrome round mirror clips, 2 tubes of mirror glue (5 fl oz - 147.86 ml), j-bar, and mounting screws. Introducing NEW MiraSafe Gym Mirrors...the clear choice for your safety! Safe: Safety mirrors that don't break into dangerous shards. Clear: Low-iron mirrors offer superior clarity without a green tint or distortion of lower-quality mirrors. Easy: Each kit comes with installation hardware, making ideal for DIY projects. Not sure how to start? Get detailed instructions with our Home Gym Installation Guide. 36" x 60", 36" x 72", 48" x 72"
Gym mirrors ship to the 48 contiguous states only. Freight Service (Curbside Delivery) provides delivery made to the curb at the end of your driveway. The driver will not bring freight into house, garage, etc. Drivers do not assist with unpacking, set-up or clean-up. Quantities vary depending on the kit you choose. If you're a dancer, yogi, or gymnast looking to check your form; if you're a weightlifter looking to refine your lift; or if you're a dancer looking to check out your sweet moves, our high-quality large gym mirrors are perfect for you. Your home gym or workout room will benefit from easy-to-install kits with all the mirror installation materials you'll need including inside the package. You can place the gym mirrors side-by-side to create a commercial gym feeling in your basement, garage or other space. No matter which room in your house, we can help you figure out how many mirrors you need and how to install them in the right configuration for your home gym. Our large-scale mirrors come in three in-stock sizes: 36" x 72"; 48" x 72"; and 36" x 60". And, you can get these in kits of 1, 3, 5, or 10 mirrors per kit. The more you buy, the bigger your discount on home gym mirrors! Our Home Gym Installation Guide has the details about how to put together your home gym. MiraSafe gym mirrors are made of real, low-iron glass. This means they are the clearest mirror you can get. Glassless mirrors are not as clear (because they are not made of real glass) and if installed on an uneven surface, the reflection will be distorted. While both types of mirrors are resistant to shattering, our gym mirrors are real glass mirrors, so you'll get superior clarity – without distortion -- along with the safety you require. Are you wondering how to make a home dance studio in your basement? Or maybe you have an idea for a yoga studio in your sunroom (Namaste!) MiraSafe gym mirrors are perfect for creating a zen-like space for you to work out or get down! Their low-iron composition means they are super clear, and will look great whether you have a disco-ball or candles going. Superior safety means if your fitness activities ever get out of hand, you won't have a dangerous situation on your hands. First, figure out how many gym mirrors you'll need. We offer gym mirror kits that are discounted based on the number of mirrors you purchase. Then, figure out the layout of your mirrors. We make specific recommendations for where to mount gym mirrors on your wall. Finally, use the included gym mirror kit contents to install your new gym mirrors. They're easy to install with the included materials, so they make a great weekend DIY project! For a very detailed explanation of how to create your home gym, please visit our Home Gym Installation Guide.